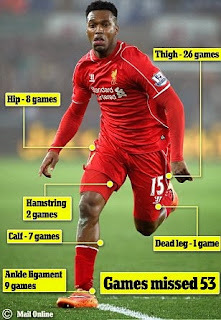 Daniel Sturridge suffered a devastating blow on Thursday as it emerged he could be out until October. The Liverpool striker had surgery on his left hip on Tuesday in New York but the severity of the problem means the 25-year-old will not be able to resume full training for four months. This latest prognosis is a huge setback for Sturridge and boss Brendan Rodgers, piling pressure on Liverpool to sign a top-class striker this summer. Sturridge’s recovery will rule him out of the big kick-off on August 8 and four England games. It is possible he will not play in the Premier League until the beginning of October. The surgery, which was performed by Dr Bryan T Kelly, has been deemed a complete success by Liverpool’s medical staff as it addressed a problem believed to be linked to Sturridge suffering so many issues with a thigh muscle. It has been a year to forget for Sturridge. When the campaign ends, he will have missed 41 of Liverpool’s 58 games and only started seven matches because of a recurring thigh problem before the hip issue occurred in a game against Manchester United on March 22.